The loud Snoring, Tiredness, Observed apnea, high blood Pressure (STOP)-Body mass index (BMI), Age, Neck circumference, and gender (Bang) questionnaire is a validated screening tool for identifying obstructive sleep apnea in surgical patients. However, the predictive performance of the STOP-Bang score in obese and morbidly obese patients remains unknown. Preoperative patients were approached for consent and were screened for obstructive sleep apnea (OSA) by the STOP questionnaire. Information concerning Bang was collected. Laboratory or portable polysomnography were performed in 667 patients. Patients with BMI of ≥30 kg/m2 were defined as obese patients and ≥35 kg/m2 as morbidly obese. The predictive parameters (sensitivity, specificity, and positive and negative predictive values) for the STOP-Bang score in obese and morbidly obese patients were analyzed. In 310 obese patients, a STOP-Bang score of 3 has high sensitivity of 90 % and high positive predictive value of 85 % for identifying obese patient with OSA. A STOP-Bang score of 4 had high sensitivity (87.5 %) and high negative predictive value (90.5 %) for identifying severe OSA, whereas a STOP-Bang score of 6 had high specificity (85.2 %) to identify severe OSA. The diagnostic odds ratio of a STOP-Bang score of 4 was 4.9 for identifying severe OSA. In 140 morbidly obese patients, a STOP-Bang score of 4 had high sensitivity (89.5 %) for identifying severe OSA. 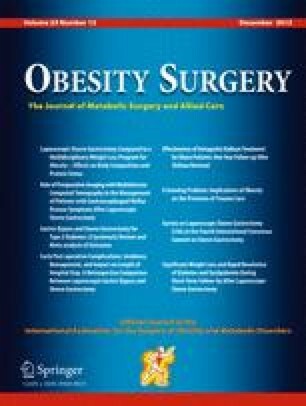 The STOP-Bang score was validated in the obese and morbidly obese surgical patients. For identifying severe OSA, a STOP-Bang score of 4 has high sensitivity of 88 %. For confirming severe OSA, a score of 6 is more specific. We acknowledge the help of Santhira Vairavanathan MBBS (Research Coordinator, Department of Anesthesia, University Health Network, Toronto, Ontario, Canada), Sazzadul Islam MSc (Research Coordinator, Department of Anesthesia, University Health Network, Toronto, Ontario, Canada), Hisham Elsaid, M.D. (Research Fellow, Department of Anesthesia, University Health Network, Toronto, Ontario, Canada), Babak Amirshahi MD (Research Fellow, Department of Anesthesia, University Health Network, Toronto, Ontario, Canada), and Hoda Fazel, M.D. (Research Fellow, Department of Anesthesia, University Health Network, Toronto, Ontario, Canada) in the conduct of the study. We also acknowledge Yuming Sun, M.D. (Registered Polysomnographic Technologist, Sleep Research Unit & Department of Anesthesia, University Health Network, Toronto, Ontario, Canada) for the readings of the polysomnography and Colin Shapiro, M.D. (Professor, Department of Psychiatry; Director, Sleep Research Unit, Toronto Western Hospital, University Health Network, University of Toronto) for the polysomnography supervision. World Health Organization. Obesity and overweighed fact sheet No 311. May 2012. (http://www.who.int/mediacentre/factsheets/fs311/en/index.html).